TORONTO — Celebrating this week’s launch of the brand new ‘Contiki SEVEN’ campaign, Travelweek spoke exclusively with Dave Marathakis, National Sales Manager for Contiki Canada, to hear his top picks for Thailand – the first destination for Contiki SEVEN – with authentic Thai experiences agents can suggest when planning a client’s dream getaway, from chasing the waterfalls of Erawan to arranging a local cooking class. 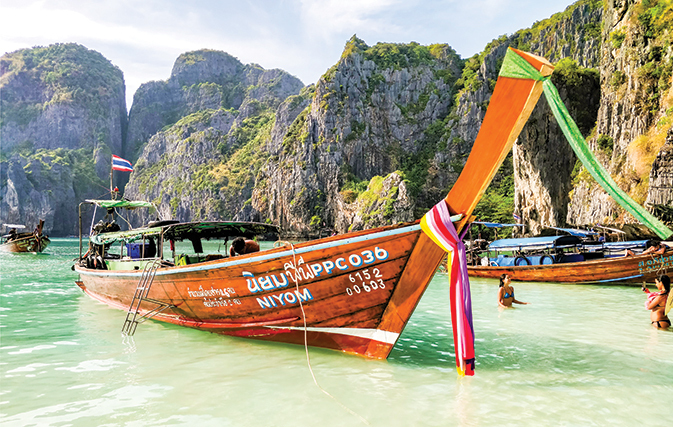 From Chiang Mai to Phuket, to the lesser-known places of Koh Tao and Koh Phangan, there’s a reason why Thailand is often considered a rite of passage destination for many young Canadians. Blessed with some of the world’s most beautiful beaches, packed full of vibrant cities, a slice of paradise on Earth their famous islands and jungle-covered karsts, the ‘Land of Smiles’ has it all. And then there’s the food. The ‘this-is-the-most-authentic-ever’ tom yum soup that you usually order from UberEATS has nothing on Thailand’s night markets. When clients are actually dining in Thailand, it’s stomach, meet food heaven. But with so much to do, see and eat, where do you begin when you have a client looking to book a trip to Thailand? 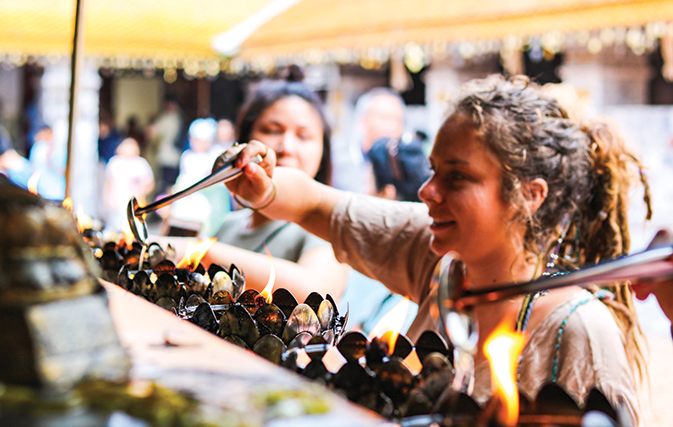 All of the experiences below are offered on Contiki’s various adventures that visit Thailand. With one click of a button, clients can easily experience a different side of the country with Contiki – one packed with food experiences, accommodation and adventures that are authentic, unique and unforgettable. “Not to mention, your clients will absolutely love you for booking them on a Contiki Thai adventure and will no doubt have you on speed-dial the next time they plan a vacation,” says Marathakis. The TreadRight Foundation, Contiki’s sustainability partner in its Contiki Cares powered by TreadRight program, found that in order for elephants to be tame enough to give people a piggyback ride for even just a few minutes, they need to be trained for months, which often involves abuse and punishment. “That is why we have been committed to enforcing the TreadRight Animal Welfare Policy, which Contiki and our sister The Travel Corporation brands have signed on to as part of the World Animal Protection’s Elephant-friendly Tourism Pledge,” adds Marathakis. If you have clients itching to view these beautiful creatures, they can do so by visiting the Elephant Nature Park in Chiang Mai – which is included in Contiki’s Thai Tripper North and Total Thailand trips. This is a sanctuary where elephants are rehabilitated and cared for and is part of Contiki’s long-standing commitment to making travel matter by safeguarding the people, places and wildlife of the places they visit for generations to come. 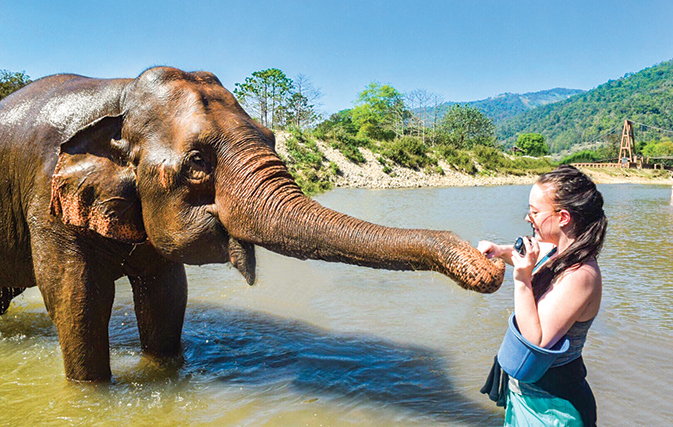 Here the guides will educate your clients on elephants and, once they learn how to interact with the gentle giants, they’ll allow them to feed, bathe and hug them while staring lovingly into their eyes, says Marathakis. Nothing is quite as adventurous as unleashing your inner warrior, and trying your hand at Muay Thai with a pro may just be one of the coolest stories your clients will write home about, says Marathakis. Not to mention, they’ll forever be in your debt for helping them look awesome on Instagram. “We’re not suggesting your clients jump right in the ring ready to score a KO in the first round, but suiting up for a class and throwing a few punches is best done with the real experts in the home of Thai boxing,” says Marathakis. 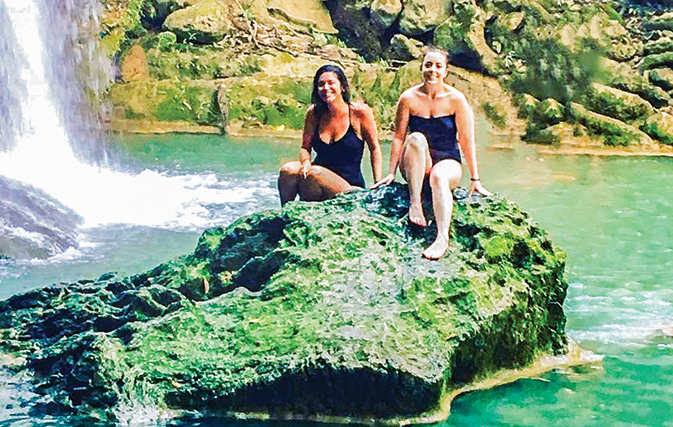 After a round, or five, clients can simply sit back and relax in the super-chill town of Pai, where Bob Marley tunes serenade the streets and thermal baths await to soothe your client’s sore muscles. This despite TLC’s sage warning in their 1994 hit song. “If your clients are looking for adventure, they’re going to love our Thai trips. We take them to Erawan Falls, one of the most famous National Parks of Thailand, which is made up of seven levels of incredible waterfalls!” says Marathakis. Here clients can take a quick dip in the emerald-hued ponds, dive into the clear waters and get an unreal FOMO Instagram shot. Why enjoy falls from afar when you can get right in them? Spicy menu item flames aren’t the only fire clients will be feeling in a Thai kitchen. If they order a lot of takeout, they’ll probably never experience the intensity of, or relish in the satisfaction of completing a bona fide Thai dish all by themselves like this ever again. In Chiang Mai, clients on Contiki’s Thai treks will have the chance to test their MasterChef skills at the aptly named The Best Thai Cookery School – one of the first in the area to offer up its culinary expertise. As Marathakis explains, “The school’s owner is the nicest man you’ll probably meet in all of Thailand. He starts by taking you to a local market to tell you all about the local produce and what flavours they add to Thailand’s traditional dishes. There, he will laugh at his own jokes and set the mood for a really fun, unique experience. When he takes you back to his gorgeous open-air kitchen that overlooks a rice farm, you’ll get the inside scoop on how easy it is to cook Thai food. The best part – you get to eat the dishes you’ll prepare. Be warned – do NOT eat the chilis! Once the royal capital of Siam – for over 400 years – the ancient city of Ayutthaya offers up a bevy of former gilded temples and treasure-laden palaces. Here clients will make a pit stop in the UNESCO World Heritage Site and do a bike tour, cycling past ornate temples, towering spires and quaint villages. It’s the perfect hit of culture for history buffs. If you thought canoeing was an only-in-Canada pastime, think again. Thailand is giving Canada a run for its money, especially when you add in the stunning shorelines of Thailand as a backdrop. 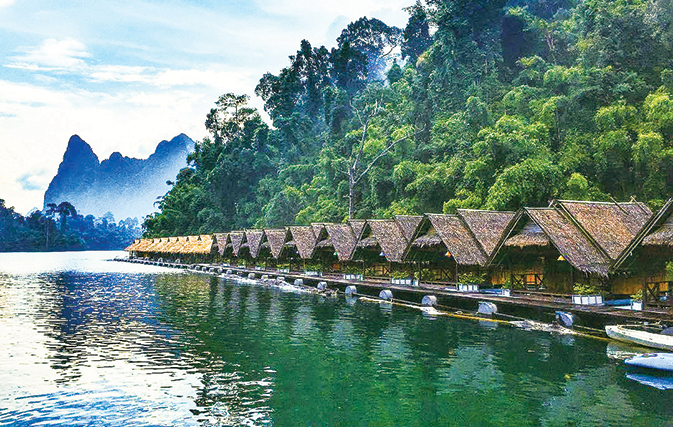 For clients looking to experience canoeing, the Thai way, Contiki’s Total Thailand trip visits the beautiful Khao Sok National Park, 739 square kilometres of nature at its finest. Here clients will be able to paddle around the park’s amazing caves and mangroves. If your clients just want to get away from it all, this is the place to do it. If you’re looking to really wow your clients, tell them about the Floating Raft Hotel – a unique accommodation that Contiki offers along the River Kwai. This is the stuff Thai dreams are made of. Clients will step aboard the boat after exploring Kanchanaburi and be met with rooms lit by candlelight where for a night or two, they’ll be forced to disconnect from technology because there’s no service on the river. During the day, clients can float down the lazy river, get a Thai massage on the decks and go hiking in the adjacent village. “The best part is at night, when clients can look up at the amazing stars that are clear to the eyes due to the lack of pollution. Not to mention, there’s also a visiting elephant called Wendy, who’s available for snuggling,” says Marathakis. If your clients are looking for the perfect Boomerang video on Instagram, they can even jump into the river directly from their room. #Travelgoals, check! Ready to book your clients on an unforgettable Thai adventure? 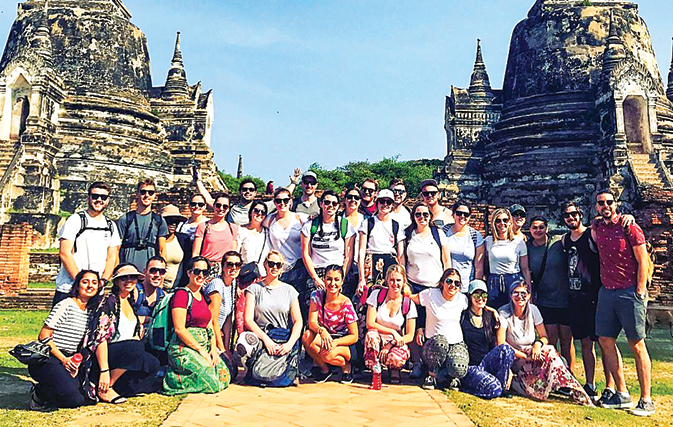 From now until March 3, 2019, Contiki is offering $250 off its most popular trips that visit Thailand for a limited time as part of its Contiki SEVEN campaign. Trips include Big Indochina Adventure, Bangkok to Singapore Adventure, Munch Asia, Total Thailand, Total Thailand plus Thai Island Hopper West, Northern Thai Highlights and Thai Tripper North. 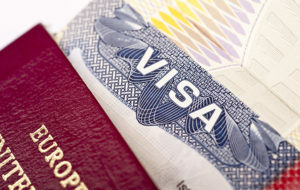 Agents can also turn every Thai booking into a cash incentive. With the launch of its revamped Contiki Rewards program for 2019, agents can earn $250 for every five passengers booked on any Contiki trips that are over seven days. For every additional five passengers booked, agents will receive another $250 in cash. Simply fill out the ‘2019 Cash Incentive’ form, which can be downloaded at contiki.com/agents, and email it to sales@contiki.ca.